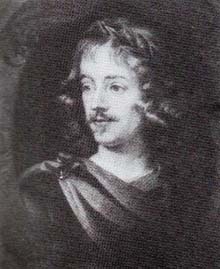 Sir John Suckling (1609-1642), poet, gambler, man-about-court and soldier to King Charles I, is credited with inventing the card game of cribbage. Although his poetry (and prose) is still considered to be of some consequence, he was neither a successful gambler nor victorious cavalier. He was born in Goodfathers, one of his father's houses, at Whitton and baptised at St Mary's church, Twickenham, on 10 February 1608/9. Educated at Trinity College, Cambridge and then admitted to Gray's Inn, he later studied at the University of Leiden in Holland. The name Suckling derived from Socling: the description of one who held land by 'socage'. The family came from Suffolk and Norfolk, settling in Norwich where their house, Suckling Hall, stands today on the corner of St Andrews Hill. There, John's great-grandfather, Richard, was sheriff, as was his grandfather Robert (1520-89), who was also mayor (1572) and MP (1571, 1586). His uncle Edmund was dean of Norwich from 1614 to 1628. His father, the youngest of six sons, was also at Gray's Inn and served five terms as MP between 1601 and 1626. He became Secretary to the Lord Treasurer, Receiver of Fines on Alienations in 1604 and was knighted in 1616. A serious competitor for the Chancellorship of the Exchequer in 1621, he became Secretary of State in March 1622 and in August was appointed Comptroller of the King's Household, an office he held until his death. Substantial alabaster memorials in St Andrews Church commemorate his life and that of his father, Sir Robert. John's mother, Martha, was the sister of Lionel Cranfield, created earl of Middlesex in 1622 and, until his unjustified impeachment in 1624, Lord Treasurer of England. His father, also John, died in 1627 leaving him a substantial fortune in trust estimated at £25-30,000. He did not actually come into this inheritance until his 25th birthday in 1634. The Whitton estate, which now consisted of two conjoined properties was sold the following year and John had little difficulty in matching his gaming losses to the proceeds. The earlier of these houses is shown on Ralph Tresswell's map of 1607, owned by "Mr Suckling", yet to be knighted for services to James I at Court. Neither of the houses has survived. The first stood at the junction of Nelson and Warren roads; the second, larger house which can be seen on Moses Glover's map of 1635 was built between 1619 and 1622 in what is now Warren Road and it was probably demolished before 1745. In 1639 he raised a body of 100 horsemen in support of the king but they were unsuccessful in battle and soon disbanded. In 1640 he was involved in the Army plot to restore the power of the King over Parliament and free the Earl of Strafford from the Tower of London. Discovery led to his flight to France on 6 May where, penurious and apparently without a future he died shortly after. The manner of his death was later recounted by Alexander Pope as recorded by Joseph Spence (1.190-91). According to Pope, in the night when Suckling reached Calais his servant drove a nail up into one of his boots before absconding with his money and papers; booted in haste and oblivious of pain, Suckling caught him 'two or three posts off', but 'the wound was so bad and so much inflamed that it flung him into a violent fever which ended his life in a very few days'. He may, in fact, have survived until the middle of July, being buried in the Protestant cemetery in Paris.